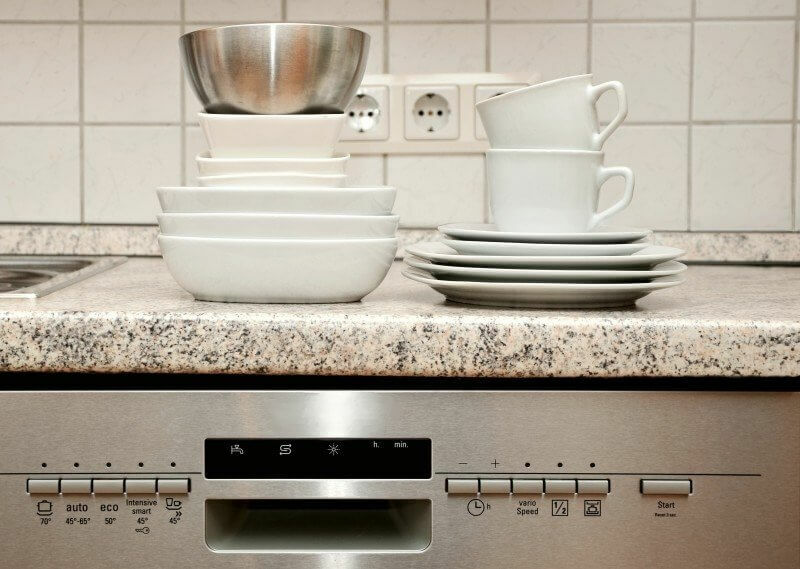 When it’s running properly, your dishwasher is a time-saving appliance that can help you streamline the seemingly endless job of keeping the dishes clean and your cabinets well-stocked. However, this appliance is prone to some simple problems that may slow down your dish washing routine. If you find a puddle of water in front of the dishwasher or open the unit to find a pool of water sitting inside, you need to act, before it becomes a troublesome flood. Fortunately, this issue is usually easy to solve with a few DIY fixes. The first thing you should do if you find standing water in the dishwasher is run the drain cycle again. In many cases, this will clear out the problem and take care of the excess water that’s sitting in the appliance. After clearing out the water, you may want to continue through the next few steps to clear out any developing clogs and prevent future trouble with standing water in the dishwasher. Run some water in your sink and see if the sink is also clogged. If both the dishwasher and sink are clogged, the issue is likely in the plumbing beneath them. Clear out the plumbing by pouring about one cup of baking soda and two cups of vinegar into the sink. Allow this to fizz for about 30 minutes. This will help get rid of many types of buildup in the pipes. Finish by pouring some dish soap into the drain and pouring a kettle of hot water down after it. If you have a garbage disposal, this may be the source of your trouble. You can help clean off a garbage disposal by tossing some ice down and turning the disposal on. The ice will knock gunk and debris off the blades without damaging them. Run water down the garbage disposal for 20 to 30 seconds to help clear out any remaining obstructions. Running the disposal for about 15 seconds after you’re done clearing plates off every day will help prevent this issue in the future. The air gap is a small cylinder, typically made of stainless steel or chrome, that connects the garbage disposal to the drain hose for the dishwasher. The air gap is meant to keep an air lock from developing in the host. However, it can become clogged. Remove the air gap by unscrewing it counterclockwise. Look for gunk and debris inside, and clear this out with a stiff cleaning brush. While you have the air gap off, you can also inspect the dishwasher’s drain hose. This can become clogged as well. Try blowing air into the drain hose to see if it flows through readily. If it doesn’t, then you likely have a clog here. You’ll need to remove the hose entirely to clean it our properly. You can typically do this wish dish soap, hot water, and a long brush. Look for the drain inside the dishwasher to make sure there isn’t a clog here. You may need to remove a plastic cover to expose the drain fully. Consult your dishwasher’s manual for instructions on where this part is located and how to access it. If there’s a visible buildup of food and other debris inside the dishwasher, you should clear this out thoroughly, so water can flow through the drain easily. Baking soda and vinegar will work here as well, to help dissolve any clogs or buildup that are lingering beyond the drain, where you can’t quite reach them. When you’re finished clearing the drain, run the dishwasher empty with about a cup of bleach inside. This will help clean the appliance out more thoroughly. Run an empty load with hot water after your bleach cycle before washing dishes in the appliance. 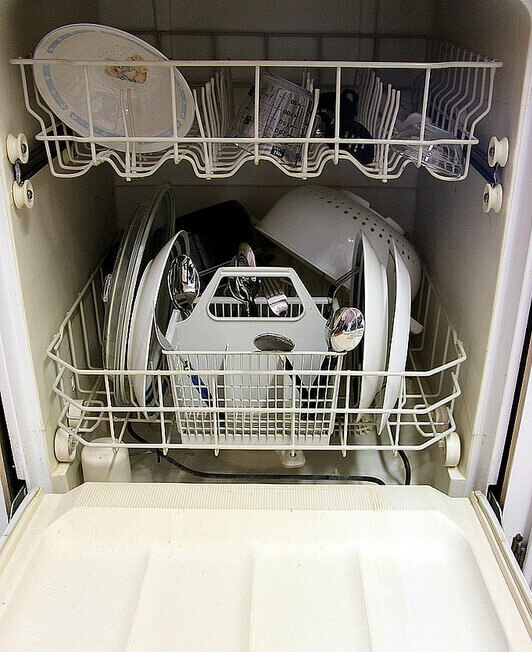 If you have repeated problems with a dishwasher that isn’t draining, despite your best efforts to clean drains and clear pipes, do speak with a professional to make sure you’re not dealing with a serious problem.If you have a home warranty covering your plumbing, you may qualify for a new dishwasher if your current appliance cannot be repaired.